Valderi Valdera: Tropic Thunder and the "R-Word"
Tropic Thunder and the "R-Word"
Tropic Thunder, a war movie satire has just premiered in theaters this week ... and I won't be going to see it. Tropic Thunder follows a trio of hot-shot action hero stars who wind up in the jungles of Southeast Asia, facing real dangers while shooting a war movie. The buzz on the film prior to its release was the controversial plot line involving Robert Downey Jr.'s character, a white actor who undergoes skin-pigment alterations in order to play a black character in the movie within a movie. The filmmakers were careful to meet with African-American organizations (and even veterans groups) for focus groups prior to the film's release to make sure that the offensive lines that were toed were never fully crossed and that people would leave the theater feeling entertained rather than assaulted. 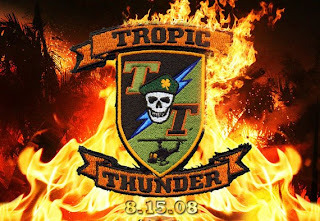 But Tropic Thunder representatives failed to meet with one very important, often overlooked minority group that became aware of offensive subplots through the film's advertisements and requested a meeting, only to be denied until mere days before opening night. Now dozens of disability advocacy organizations and individuals, led by The Arc of the United States, the Special Olympics, and the National Down Syndrome Society, among others, have called for a nation-wide boycott of the film. Their reason? Numerous, offensive repetition of the "r-word" ("retard"). The term “retard” has been characterized by disability rights advocates as hate speech that heaps insult and possible harm on a group that has a long history of being stigmatized and vulnerable. They compare it with racial, ethnic and sexual epithets and stereotypes that have historically been used by majority groups to target and humiliate minority groups. Tropic Thunder representatives, including director and star Ben Stiller, have argued that advocacy groups are missing the point - the film was not intentionally inflicting harm and ridicule on people with disabilities but was rather ridiculing the self-serving Hollywood and actors who portray people with disabilities in order to win coveted awards. But really it is the filmmakers who are missing the point. Even if harm was not intended, harm has been inflicted by the fact that the language is used repetitively and for humor without acknowledging that the language is demeaning and demoralizing. The casual use of the "r-word" in our media promotes that it is acceptable to use this language when referring to or communicating with people with disabilities. The advocacy groups have every right to boycott the film and stand their ground even as the general populace rolls their eyes and insists "it's just a movie, stop making a big deal about it". It is just a movie but sitting back and allowing this language to continue to pervade our vocabulary is not acceptable. People need to be made aware that the "r-word" is just as reprehensible as the "n-word" - it's hateful language that "perpetuates the negative stereotypes that face people with intellectual disabilities every day". R-word.org is a recently established website where people can be educated on the stigma of the "r-word" and pledge their support in the elimination of the derogatory use of the word from everyday speech. More than 5,600 people have signed the petition - join us and help to promote the acceptance and inclusion of people with disabilities. We all deserve to be respected and to be heard.